The BC-6520 is designed with durability for transporting bulk loads up to 2000kg. 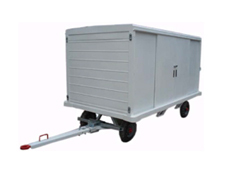 Three side fixed panel with lockable double slide metal panel safely protects the bulky mail bags/tiny mail boxes during towing. Smooth steel plate formed into “V shape along longitudinal centre line for increased load stability. The fifth wheel steering system ensures smooth turning of the baggage cart, keeping each cart in a train to follow the identical track of the towing tractor. The BC-6521 is designed with durability for transporting bulk loads up to 2000kg. 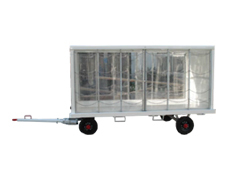 Heavy duty waterproof sliding transparent curtains with stainless steel posts and chains on both sides keeps away rains and strengthens curtains durability; Operator can see easily condition of loads inside the cart at a glance even with curtains closed. The fifth wheel steering system ensures smooth turning of the baggage cart, keeping each cart in a train to follow the identical track of the towing tractor. Rear Hitch – Spring-loaded vertical pin hook type. Wheels –  Hubless rims with solid rubber 4.00yres fitted as standard. Painting – After sand blasting, 1 layer of high quality primer and 2 layers of enamel paint are applied for a durable finish. The BC-6603 is designed with durability for transporting bulk loads and is available in many configurations depending on capacity and accessories. 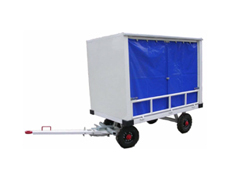 Equipped with waterproof sliding PVC curtains at both sides for keeping away rains; top panel, front & rear panel and frame material is steel. 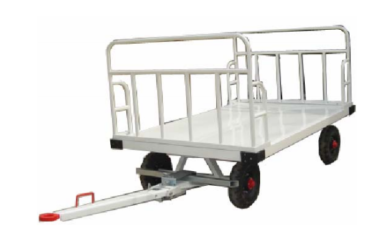 The fifth wheel steering system ensures smooth turning of the baggage cart, keeping each cart in a train to follow the identical track of the towing tractor. The CD-2300 is designed with durability and appealing appearance in mind. 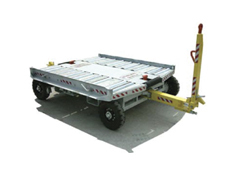 Equipped with 52 each galvanized rollers on the dolly bed to enable free loading/unloading at either side. The Ackermann (2 wheel knuckle) steering system ensures smooth turning of the dolly, keeping each dolly in a train to follow the identical track of the towing tractor. CD2300 is designed to handle 2 x LD1 or 2 x LD3 container. The CD-6146 is designed with durability and appealing appearance in mind and is available in many configurations depending on capacity and accessories. 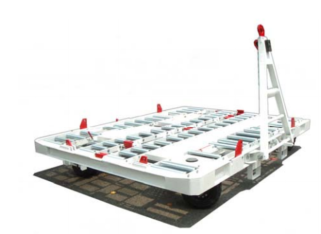 Equipped with turntable and pedal locking system allow the dolly bed to freely rotate 360o and to securely lock at 90o position for more flexible container loading/unloading. The Ackermann (2 wheel knuckle) steering system ensures smooth turning of the dolly, keeping each dolly in a train to follow the identical track of the towing tractor. The CD-6610 is designed with durability and appealing appearance in mind and is available in many configurations depending on capacity and accessories. 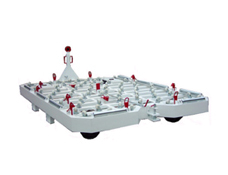 Equipped with turntable and pedal locking system allow the dolly bed to freely rotate 360 degrees and to securely lock at 90o position for more flexible container loading/unloading. The Ackermann (2 wheel knuckle) steering system ensures smooth turning of the dolly, keeping each dolly in a train to follow the identical track of the towing tractor. The CD-6620 is designed with durability and appealing appearance in mind and is available in many configurations depending on capacity and accessories. 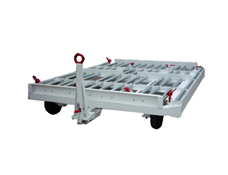 Equipped with turntable and pedal locking system allow the dolly bed to freely rotate 360o and to securely lock at 90o position for more flexible container loading/unloading. The Double Ackermann (4 wheel knuckle) steering system ensures smooth turning of the dolly, keeping each dolly in a train to follow the identical track of the towing tractor. The CD-9610 is designed with durability and appealing appearance in mind and is available in many configurations depending on capacity and accessories. 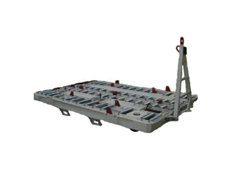 Equipped with turntable and pedal locking system allow the dolly bed to freely rotate 360o and to securely lock at 90o position for more flexible container loading/unloading. 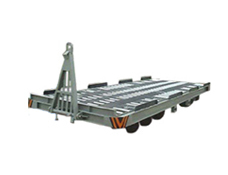 The transfer bridge is a special feature that enables a container easily to be transferred between two consecutive dollies. The fifth-wheel steering system ensures smooth turning of the dolly, keeping each dolly in a train to follow the identical track of the towing tractor. 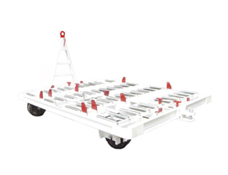 The TLD Pallet Dollies are designed with durability and appealing appearance in mind and are available in many configurations depending on capacity and accessories. Model PD-1010 consists of retractable pallet stops which is capable of handling P1, P6 and FQA pallets. Container restraints are also equipped that allow PD1010 to handle 2 x LD1, 2 x LD2, 2 x LD3, LD5, LD6, LD8, LD10, LD11. 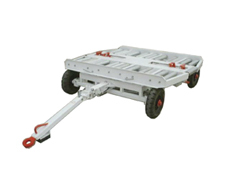 The TLD Pallet Dollies are designed with durability and appealing appearance in mind and are available in many configurations depending on capacity and accessories. Model PD-1014 consists of retractable pallet stops which is capable of handling P1, P6 and FQA pallets. Container restraints are also equipped that allow PD1014 to handle 2 x LD1, 2 x LD2, 2 x LD3, LD5, LD6, LD8, LD10, LD11. Side stoppers can be added as an option to handle LD7 & LD9. The PD-2014 is designed with durability and appealing appearance in mind and is available in many configurations depending on capacity and accessories. With fixed or retractable side guides and retractable pallet stops, PD2014 is capable of handling 2 each 96 X 125 or 1 each 96 X 240 pallet. The PD-2200 is designed with durability and appealing appearance in mind. 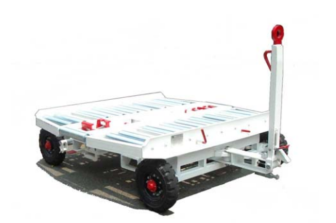 Equipped with 9 each galvanised side rollers and 72 each casters on the dolly bed to enable free loading/unloading at both sides and end. 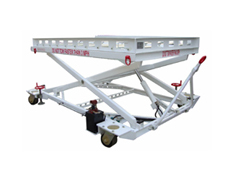 The free swivel double-wheeled steering system ensures smooth turning of the dolly. With spring loaded tip-up pallet stops, PD2200 is capable of handling pallets P1P and P6P pallets and 2 xLD1, 2 x LD3 and 2 x LD8 containers. 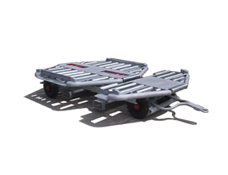 The TLD Pallet Dollies are designed with durability and appealing appearance in mind and are available in many configurations depending on capacity and accessories. Model PD-6620 consists of retractable pallet stops which is capable of handling P1, P6 and FQA pallets. Container restraints are also equipped that allow PD6620 to handle 2 x LD1, 2 x LD2, 2 x LD3, LD5, LD6, LD8, LD10, LD11. Side stoppers can be added as an option to handle LD7 & LD9. The PFT-2.2 is specially designed for MSP handling during its maintenance and transporting. It’s scissors lifting based roller type pallet dolly with hand pump. The lifting height from 20 inches (510mm) to 50 inches (1270mm). Lifting capacity up to 2,200lbs (1,000 Kg) and suitable for 108.5inches (2756mm) x 62.5 inches (1588mm) Mission System Pallet (MSP).